We can NEVER relax again! When a baby is born, you know life will never be the same again. You know you might have to wait 18 or so years before your child leaves you alone long enough for you to have a nice cuppa. The reality is, when a baby is first born, you get plenty of time. Well with BB we did anyway. He slept ALOT. I think this happens for life to ease you into a false sense of security before BOOM they don’t sleep as much as they did. Then you still don’t have it too bad. The little man or lady in your life is still pretty restricted. You can lay them down, stick them in a play pen and they are as content as a pig in poo! THEN they get mobile! At first its cool, cute, maybe even fun, but soon your devising a way to place a tracking device on them just to keep track! BB started slowly, he started with an army crawl. He crawled with his arms, while pushing himself along with his big toe! The he got the whole crawling thing, but occasionally he still went back to the old ‘crawl ‘n’ push’. Then he got better with the crawling, now hes off and I am pretty sure if we didn’t keep an eye on him, he would be sat in the pub with a pint in his hand before we noticed! We really need to go buy some gates! We’re doing it all wrong! 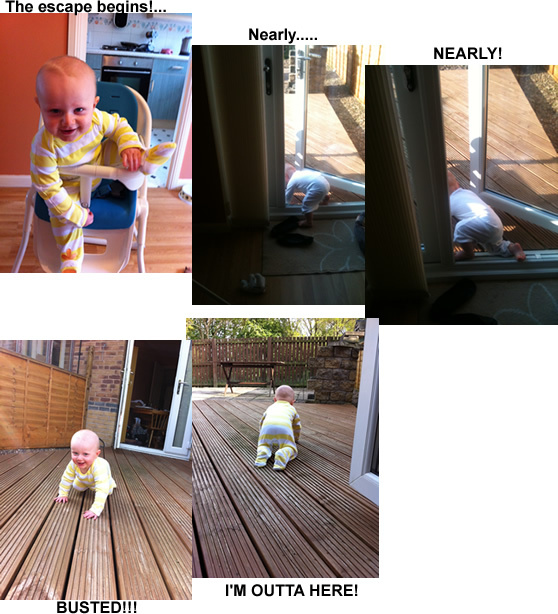 Did he climb out of the chair in the first pic?? Not this time, but im sure it will happen eventually. Thats why they have straps, right? God I remember that happening, wait until he starts standing up, nothing will ever be safe again! LOL yeah that sounds familiar. Wait still he starts walking then you have to look the doors or he’ll be off the to clubs :0) Its very challenging but enjoy. Funny you should say htat, we cought him trying to eat a stone today! Need some sort of electric fence!…..for babies. lol I would tell you that things get better now but I know you know I’d be lying! Our youngest climbed the stairs herself at 8 months – we’d got out the habit of closing the bottom gate because we didn’t need to pen her older sister in as much any more. That’s her older sister who, at about 2 years old, opened the front door and wandered down the street without us noticing!